A glamorous bathroom can make your home beautiful. We spend quite some time here, particularly every morning before rushing off for work. When it has a lovely look you start the day in a fresh way. 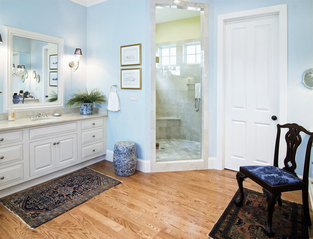 If your bathroom is dull and dreary, transform it into a stylish area with our bathroom remodeling services. Everything right from the flooring to the paint can be changed into a new look through our professional remodeling services. Why Should You Remodel Your Bathrooms? The latest materials in bathroom flooring and fixtures offer not only a wonderful look but they are also easy to maintain. Features such as anti-skid flooring give more safety. The latest toilet models work fast and use less water, which adds to your convenience. We use materials only from the top brands in the industry to give your bathroom and professional look and long-lasting quality. When you come to us you will get nothing but the best in materials and workmanship. The result is superior quality baths that are absolutely fabulous. How We Carry Out Bathroom Remodeling? The entire remodeling process is done by skilled remodelers who will carry it out meticulously so that the finish is fabulous. Before we get down to doing the remodeling work, we will check the condition of the existing bathroom and come with up ideas on how it can be changed. Our skilled and experienced staff will give suggestions on flooring, fixtures and other accessories that are suitable for your bathrooms. 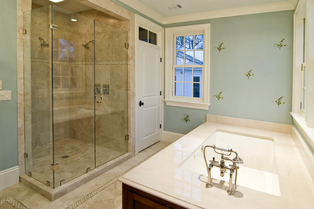 Every aspect of the bathroom remodeling process will be discussed in detail with you. We will look into your every need and requirement to incorporate elements that are comfortable for your needs. Work will commence once you decide on flooring colors and fixture models. Our skilled staff will make use of the latest tools to complete the remodeling work. While the work is in-progress we take care not disturb other areas of the home, thus enabling you to carry out activities peacefully. The installation process will not result a mess in any adjoining areas. Our installers are skilled and licensed processionals who use the latest installation techniques to give you the best results. The result is a beautiful installation showcasing a lovely finish that will give you complete satisfaction. We have remodeled bathrooms in the Melrose, MA area of various sizes and will show you the finished look of our latest projects. We also have a huge catalog of finished bathroom photos from which you can select one that is appropriate for your remodeling needs. We can also implement your custom ideas to give a remodeled finish that is according to your specific style and color preferences. Our prices for bathroom remodeling are very affordable covering everything from the measurement to the cleanup after installation. We can do an installation according to your budget, enabling you to get high quality remodeling done, but without incurring heavy expenses. Whatever be the reason for remodeling, our staff will do it according to the way you want it to look. Give us a call and we will be there right away for inspection. Want to discuss your bathroom remodeling project? Give us a call at 781-665-3269 today!